This mosaic appears above the entrance to the Monastery of the Apocalypse on the Island of Patmos. 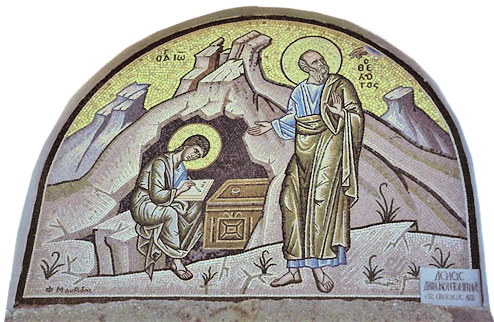 According to legend, John received his vision in a cave now enclosed by the monastery. Here John is dictating his visions to a scribe. Photo by Reta Finger. Do you remember that Sunday school picture of Jesus knocking at a door representing one’s heart? Have you ever heard a sermon castigating lukewarm Christians whom Jesus will spit out of his mouth? These images come from the letters to the seven churches in chapters 2 and 3 of Revelation. But although these images may be familiar to us, we rarely understand them in their cultural and literary contexts. Click on a map image below to enlarge. 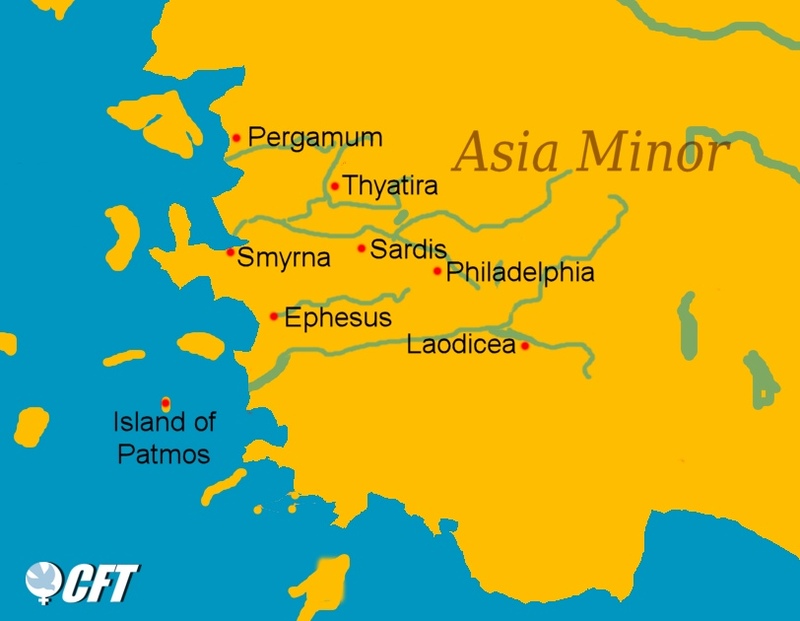 The map on the left covers the largest area, the map on the right is a closeup of the Asia Minor area discussed in this post. 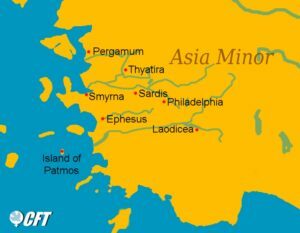 In our last lesson, John’s vision presented the risen Jesus with authority over the churches in seven cities known to John in Asia Minor. “Write what you have seen,” commanded Jesus in Revelation 1:19. On the map on the right above, we can see the seven cities—Ephesus, Smyrna, Pergamum, Thyatira, Sardis, Philadelphia, and Laodicea—situated in a rough circle. 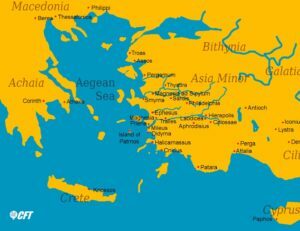 This would imply that John had lived in Ephesus (home of the first of the churches he addressed and the city closest to the volcanic Island of Patmos where he was exiled) and had regularly made a circuit to visit each church in turn. I marvel at the literary artistry that ties together the varied descriptions of Jesus in the first chapter with each of the churches. Jesus is also the pastor who “walks among the seven golden lampstands,” which are the seven churches (Ephesus, Rev. 1:20; 2:1); “who was dead and came to life” (Smyrna, Rev. 1:18; 2:8); “who has the sharp, two-edged sword” (Pergamum, Rev. 1:16b; 2:12); “who has eyes like a flame of fire and whose feet are like burnished bronze” (Thyatira, Rev. 1:15a, 16c; 2:18); who holds the seven stars in his right hand (Sardis, Rev. 1:16a, 3:1); who holds a key that no one else can use to open or shut (Philadelphia, Rev. 1:18b; 3:7); and who is “the faithful and true witness,” the “firstborn of the dead” (Laodicea, Rev. 1:5; 3:14). Equally fascinating are John’s allusions to related scripture passages. Believers in Ephesus who conquer are promised “permission to eat from the tree of life” (Rev. 2:7), harking back to the tree of life in the Garden of Eden (Genesis 2:9). Jesus tells Smyrna he is “the first and the last,” echoing Isaiah 44:6 and 48:12. The “hidden manna” of Revelation 2:17 reminds those at Pergamum of the manna eaten by escaping Israelite slaves in the desert (Exodus 16:14-15,33-34). 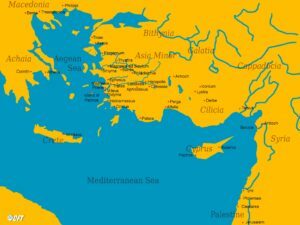 The promise to Thyatirans who conquer (Rev. 2:26-27) comes from the Septuagint (Greek) version of Psalm 2:8-9: authority to rule over the nations. And on and on. Altogether, John includes over 400 allusions to texts in the Hebrew Bible. If you have a copy of the NRSV with Apocrypha from the American Bible Society, you will find a thicket of cross-references on each page of the book of Revelation. I stand in awe of John’s knowledge of his scriptures! Bearing in mind Lesson 4 about the unique abilities of shamans and prophets to receive visions in an “altered state of consciousness” (ASC), I ponder the connection between John’s human contribution and what is being revealed to him in this vision. Although John has an out-of-body experience (Rev. 1:10), Jesus appears to him only in a form that he can describe from his own immersion in scripture, from word-pictures used by previous prophets with the same kind of ASC gifts. I also believe that John already understood the spiritual conditions of his churches. The supernatural aspect of the vision, then, must be the Messianic power Jesus exudes both to commend and chasten these believers. Perhaps Jesus organizes and focuses John’s intuitions, endowing him with divine authority to convey these messages to John’s churches. Though John may have known their strengths and weaknesses, now he is able to write down these insights as directly from Jesus rather than just from himself. We can make one more observation: each church will hear not only its own message but will learn about the problems and promises of the other six as well. Since no church can thus hide its failings (or strengths), none can lord it over the others. If they take John’s vision seriously, they will instead be in a position to support each other. Following lessons will examine the message to each church in more detail. How do you see the merging between divine and human in this vision from Revelation chapters 1 through 3? 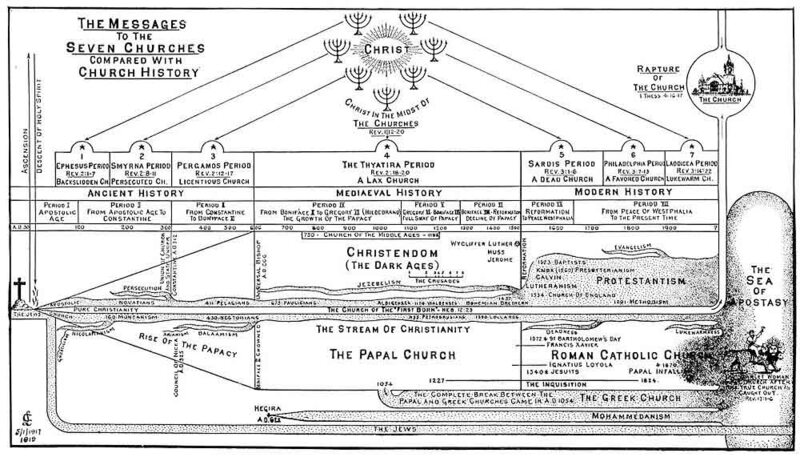 In the dispensational view of Revelation, the seven churches represent seven eras of church history, from John’s time to our present age. See a pictorial representation at http://www.sacred-texts.com/chr/tbr/img/01900.jpg. How would you respond to that interpretation in light of the above information? *Ted Grimsrud. Triumph of the Lamb. Herald Press, 1987, pp. 35-36. **Michael Gorman. Reading Revelation Responsibly. Cascade Books, 2011, p. 87. Reta Halteman Finger is a long-time member of EEWC-CFT and is a past Southeast representative on the EEWC-CFT Council. She holds a Ph.D. in theology and religion from Northwestern University, masters of theological studies from Garrett Evangelical Theological Seminary and Northern Baptist University, and a master of education from Boston University. Reta retired in 2009 from teaching Bible (mostly New Testament) at Messiah College in Grantham, PA. She lives in Harrisonburg, Virginia, and since her retirement from Messiah College has been devoting her time to writing and speaking projects, as well as some part-time teaching at Eastern Mennonite Seminary. 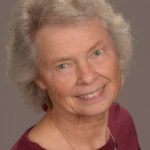 For fifteen years, Reta edited the Christian feminist magazine, Daughters of Sarah (no longer published), and is a frequent writer and reviewer for Christian Feminism Today. Using the search box on the homepage of our EEWC-Christian Feminism Today website, you’ll be led to many of her online articles. 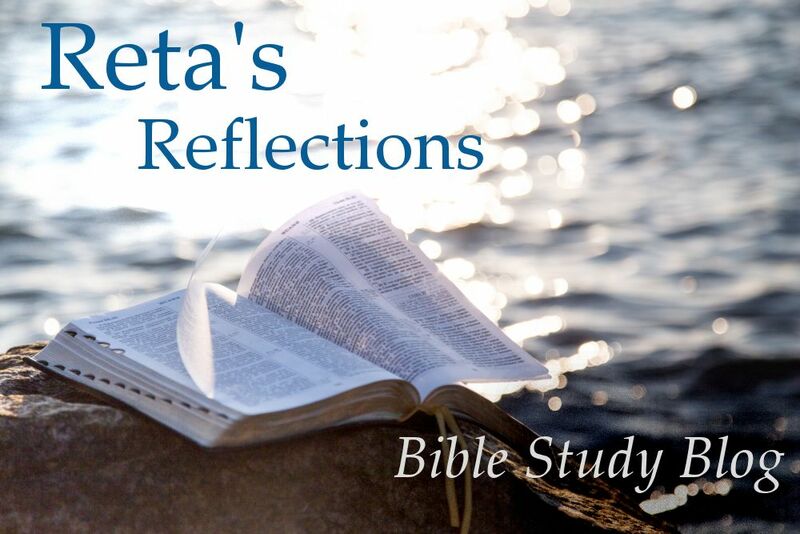 Reta's Reflections is a series of Bible studies taught by Reta Halteman Finger. These Bible studies are written from a Christian feminist perspective. Reta emphasizes how to read different genres of biblical literature in their historical contexts and then wrestle with how they might relate to Christians today. Like to receive each new installment of Reta's Reflections in your email inbox? You can! Just enter your email address in the box below and click "Subscribe." You'll receive a confirmation email with a link to click (to confirm your subscription) after submitting your address here. Having trouble picturing the geography? Maybe we can help. 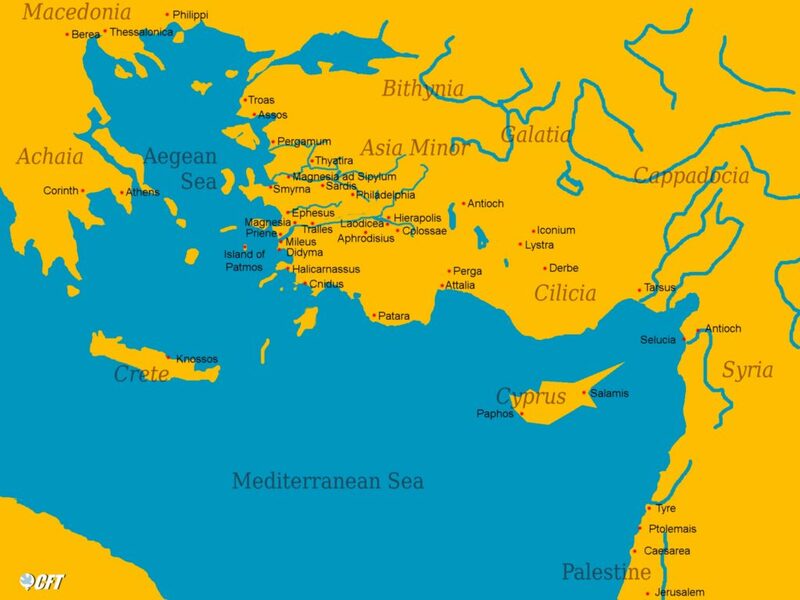 Click here to open a printable map of first century Palestine. Map will open in a new tab or window. Click here for the index of the Bible study series, Gendered Letters: The Pastoral Epistles of 1 & 2 Timothy and Titus. Click here for the index of the Studies in Revelation series Bible study. Click here for the index of the Philemon series Bible study. Click here for the index of the Studies in Hermeneutics series Bible study. Click here for the index of The Story of Jonah series Bible study. Click here for the index of the Studies of John's Gospel Bible study. 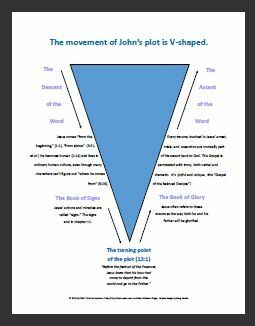 Click on the image to open a diagram of the conceptual and literary path John's Gospel takes. Click here for the index of the 1st Corinthians series Bible study. Click the map image to open a map of important locations mentioned in Paul's letters. Sodom’s Sin: What Does the Bible Actually Say?